Someone famously said there’s nothing to writing: just sit down at a typewriter and open a vein. Less famously, I’d say there’s nothing to blogging, either: just stand up in front of an audience and strip– till you’re stark naked. 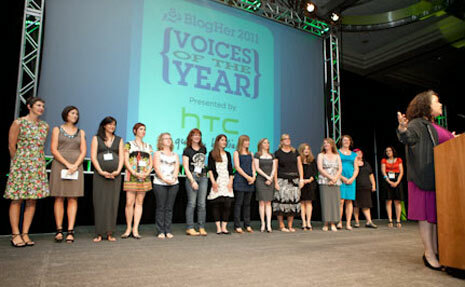 Which is kind of what it’s like to be one of the Voices of the Year—my peak experience at BlogHer (if you don’t count the free Dove Bars). Speaking in public brings up another one of those well-known lines—if you feel nervous, just imagine your audience naked. Which makes the public strip far easier at BlogHer– with an audience made up of experienced strippers. I hadn’t heard any of this yet, as we were led from the “green room” into the ballroom to settle backstage before we would take our turns reading. Mostly everyone was nervous. Really nervous. Not me; not after a career as a TV newscaster. But even though public speaking is well within my comfort zone, I wasn’t feeling comfortable. Something tugged at me. Something wasn’t right. And as we waited backstage, moments before the event I suddenly realized what it was. So I got up and left the group shortly before we were announced. Back outside in the hallway, I headed straight for the restroom. Somehow it seemed important; a symbolic act. And maybe it was. Blogging is all about being authentic; being yourself. Letting it all hang loose. So this little episode held lessons for any blogger—Get rid of what’s holding you back or holding you in. It felt right. And I was completely in my comfort zone when I stood on the stage and stripped. Not that anyone would have noticed I was sans- Spanx —a delicious irony since I was reading a post about how women become invisible as we get older. Next time I speak in public I’ll go one better. I’ll be wearing red underwear. Here’s a link to all the posts as they were read; I’ll share video as soon as it’s posted. Congratulations!!!!!! Can’t wait to see the video!!! 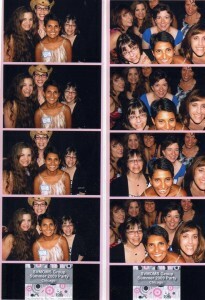 Very proud of “my” blogHer. Looking forward to seeing the video. How exciting and fulfilling! Thank you for sharing and inspiring us! I loved you when you got up and read your post and now I love you even more. This brought tears to my eyes. I thought you followed the underwear lady perfectly (her piece was very moving for me) and little did I know you’d stripped yours off. I agree with you that blogging is a lot like stripping naked and bleeding in public. I’m still not entirely certain why I do it or that it is even healthy that I do. But do it I do. And I’m glad you do it too, Darryl. Thanks for this post. I so wish I could have seen you…one of the best parts of BlogHer…I haven’t read anyone’s yet, waiting until I can get comfy and have time to read them all. Thanks—and thanks for the image of red Spanx! Much appreciate your words—and you. It was fulfilling, and fun–and you will really enjoy hearing the women reading their posts. Especially since you’ve been blogging, they will surely inspire you. Thanks so much, Denise. You’re so sweet; your comment makes me want to go back and do it again, and get to meet you in person this time. Funny, when I listened to Lori read about the red underwear I really did think of mentioning taking off the Spanx–but didn’t want to get off track. Have to say I used to wonder why I was blogging, too and enjoying it so much–and I think part of the answer for me is that it connects me to people–like you, like this. It’s a great feeling and I’m guessing it feels the same for you. Thanks so much for your comment; and so glad we connected. I surely deserve that red underwear! And I plan to get it, too. 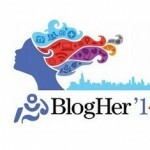 Thank you; wish you’d made it to BlogHer this year–the whole experience was amazing, as usual. Missed seeing you. 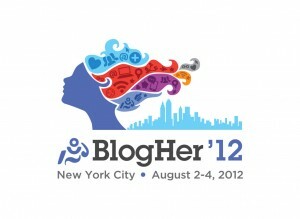 Now I feel even worse that I choose to skip BlogHer this year. Thanks for the link to all the posts. Yours especially is a topic I am far too aware of, I am in that invisible zone and trying hard to be seen and heard. Looking forward to NYC 2012. Hey – you were great. I had no idea you did that. How beautiful. What a joy it was being back there with all of you. Next time… sans underwear all together! I was surprised how many women stopped me after I read and told me how much this issue resounded for them—though they’re nowhere close to 50 yet. You did miss a great time but don’t feel bad; just look forward to next year–lucky for you it’s on your side of the country again. I’ll look forward to seeing you there; and also nice to see you here. Thank you!! And it was so nice seeing you in person. Yes I did that. I could never make this stuff up. Wishing you much happiness with your soon-to-come bundle of joy. Will look forward to reading about it–and seeing you next time—with or without underwear. I wish everyone had an opportunity to have their words heard, read aloud. How wonderful to meet you, and such an honor to stand with you, behind stage. Thanks so much for visiting me and staying in touch. I loved getting to meet you and share such a memorable experience. There was one other opportunity for people to read their posts out loud if they were not voices of the year. It was a session at BlogHer one night called “Listen to your mother”–it’s traveling around the country so lots more people will get to see and hear bloggers in their local areas. I don’t know if you were there for that, but it was one of the highlights of BlogHer for me–hearing so many incredibly talented, poignant, hilarious stories–fantastic!